CANTINE APERTE 2015: DRINK WHAT YOU SEE (AND SEE WHAT YOU TASTE) On the favorite day of all the winelovers, Borgo Stajnbech waits for you with a lunch and a dinner that put together delicacy, show cooking and tasting tips. Plus a special date for those who love Italian two-wheelers. On the year of EXPO, with the eyes of the whole world pointed on nutrition and food, Borgo Stajnbech offers you a special chance to learn how to appraise and appreciate what you can find on your fridge. By popular demands, chef Gigi Zanco and oenologist Orazio Franchi come back for "TESTA IL VINO MENTRE TI CUCINO" ("Test the wine while I cook for you"): a lunch and a dinner that put together a show cooking, a cooking lesson and a class of wine and food matching. To participate, reservation is indispensible: you can call 0039 421 799 929 or write us at info@borgostajnbech.com. For those who love both good wine and two-wheelers, we suggest not to lose the "Vespas Kilometre" by Vespa Club Fiume Veneto: two houndred Vespa will enter our courtyard for a toast with all our guests. All day long: our sommelier's wise (wine) tips and tasty venetian finger food. 11 am: Vespa Club Fiume Veneto's Vespas Kilometer arrival. 12 am: Lunch with "TESTA IL VINO MENTRE TI CUCINO" ("Test the wine while I cook for you").To participate, reservation is indispensible: you can call 0039 421 799 929 or write us at info@borgostajnbech.com. 18:30 pm: Dinner with "TESTA IL VINO MENTRE TI CUCINO" ("Test the wine while I cook for you").To participate, reservation is indispensible: you can call 0039 421 799 929 or write us at info@borgostajnbech.com. We are available to answer all your questions! 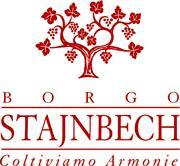 Quality and care: these are the key words in Borgo Stajbech's philosophy. The small but dynamic family company, located half way between the Venice lagoon and the hills of Friuli, distinguishes itself for the high quality of its wines. Putting passion for winemaking and respect for nature in the first place, Adriana and Giuliano are happy to offer their guests a special product and the warmest of welcomes: in their winery, you're never "just" clients.